Lula prepares to take his place on the world political stage, in the role of newly empowered spokesman for the Caribbean and the South and Central Americas regions. Brazilian President Luiz Inácio Lula de Silva was officially recognized by the Food and Agriculture Organization, and the World Food Program (WFP), both commissions of the United Nations, as a ‘Champion’ for his aggressive leadership role in the effort to end hunger and improve nutrition in Brazil, and the developing world, and for re-emphasizing hunger as a critical global concern and U.N. priority. Brazilian President Luiz Inácio Lula de Silva was officially recognized by the Food and Agriculture Organization, and the World Food Program (WFP), both commissions of the United Nations, as a ‘Champion’ for his aggressive leadership role in the effort to end hunger and improve nutrition in Brazil, and the developing world, and for re-emphasizing hunger as a critical global concern and U.N. priority. The progressive anti-hunger program in Brazil – Fome Zero (Zero Hunger) – is a model for other nations overtaken by poverty, increasing populations and inadequate food supplies. Brazil has taken the next step in advocacy against hunger by assuming an active role in the establishment of similar programs abroad. Mercusor Press reported that Brazil, in partnership with the WFP, provided technical support to help governments in Latin America, Africa, and the Caribbean run their school meal programs, giving pupils hot meals and helping them to build a nutritional foundation for the future, and is also assisting WFP emergency operations in Haiti distributing aid to victims. President Lula will leave office in January, however, observers maintain that he has obvious intentions of ascending to a more visible and vocal position in world affairs as they relate to his country, region, and the myriad global crises in need of fresh, objective advocacy. The inclusion of Brazil on the U.N. Security Council signals a definitive swing in the balance of its increasing global influence. President Lula appears fully aware of the potential he possesses to make serious inroads in matters that have been stymied by impasse at the negotiation table. Stepping fully into the circle of global politics, Lula has taken decisive steps that reflect a determination (and a strategy) to raise the region he represents to a status of equality with the rest of the world. It is too early to speculate on the reverberations from the newest political collaboration for Brazil in the recent signing of their first major military cooperation agreement with the United States in decades. The agreement provides for cooperation in research and development, information exchanges, and allows for joint military exercises and training, and points to an increased sense of partnership between Brazil and the US. 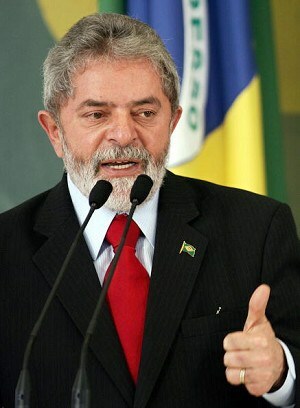 President Lula da Silva, questioned about the significance of a recent agreement between the US and Russia to reduce nuclear arms in an interview with the Spanish daily, El Pais, replied that “if we’re talking about deactivating what’s already expired, it doesn’t make sense.” Lula added that he rejected a situation in which “some countries are allowed to be armed to the teeth while others are left unarmed,” in an apparent allusion to US support for sanctions against Iran.